Hand Crochet offers a thousand different possibilities make for yourself or as a gift a variety of things. So, eg, with special thread and the hook can be connected even loofah virtually any shape and size. And it will make absolutely no hard, since they do basically the simplest bindings. The only drawback may be the only unusually tight thread, but you can get used to it and adapt. 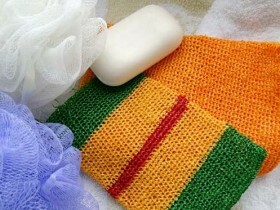 Therefore, learn to crochet washcloth will be easy, even for beginners. Knit wool can be made of synthetic polypropylene thread, rapier, flax yarn or sisal, and a hook for them to take better thicker, so they do not get too stiff. 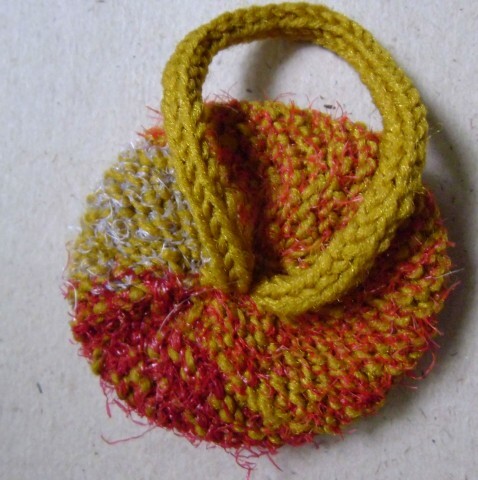 Consider a few examples of different knitting patterns and sturdiness. Peeling very well suited washcloths, mittens connected in the form of round or. For them, taken harder thread, eg, polypropylene or nylon, but if the skin is very sensitive, it is better to use sisal. 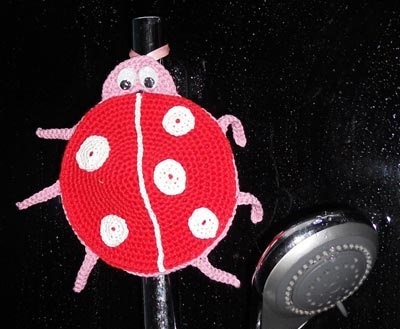 The easiest way to crochet washcloth round, so let's start learning tinkering it is with her. Fold the thread in two additions, and will continue to knit circle hook. Make a moving loop, provyazyvaem it three columns without sc, then in the next row are increasing the number of loops twice. Then in each row do even the addition of a circle into six loops. Loofah knit to the desired size. Then to the wisp of tow on the reverse side for convenience, you can sew along its diameter gum, and vyvyazat loop of stitches, for which it will be easy to hang to dry. Knit round sponges can also dishwashing. Make a chain of air 30 petelek (if the hand is wide, it is better to make more loops) and connect it to the ring. Then in a ring around poles without provyazyvaem nakida, not forgetting, that in the beginning of the series should be done 1 air loop for lifting, and at the end of last and the first loop of the next row is connected polustolbikom. Mitten fit until the end of the little finger, then the loop is divided into four parts, each of which in subsequent ranks unbroken one loop. In conclusion, the four remaining sts provyazyvaem as one, then the chain of provyazyvaem 15-20 loops and connect them to the same point, where the first loop is knitted, loops for gloves. Make a chain of air 30-40 loops, then combine it in a ring polustolbikom. About 8 series provyazyvaem ring around the posts without nakida. Beginning with 8 series to size, vyvyazyvayut elongated loops and dressed them in linen. Then turn the canvas and continue to knit washcloth columns without nakida more 8 series. In such a washcloth, to soap her better foamed can sew sponge, as it usually handles dovyazyvayutsya. washcloths pen can make a chain of air loops, or the knit of her polustolbikov several rows or columns, without sc. Baby washcloths are made from softer thread, eg, flax, or sisal, in order that they may not injure the delicate skin of baby. For kids such products create better of bright thread, as well as using several colors. They can do in the form of balls, rectangles, etc.. But the most spectacular, of course, will washcloths toys, hooked. Consider a couple of examples of sponges for kids. Making a chain of ring, consisting of 50 stitches. Provyazyvaem 6-7 rows of columns, without sc. At the last stage is going to sponge on one edge of the accordion and sewn, so that in the end turned out a product in the form of a ball-bud. This sponge is a boon for small children, as it looks colorful and fun. The upper part of red thread knit as follows: Create a ring of five loops and get involved in it 10 columns without sc. Starting with the first row, knit into each loop poles, without sc, adding in each row of three loops. Such series do about 20. Then knit crochet next round of the abdomen, same, with the only difference, It is that we add evenly in a row of six loops, and thread take longer pink. After finishing knit circle, the thread does not break, and a chain of provyazyvaem 5 stitches, which is fixed for the fifth loop the last row of the circle. This is the beginning of the head. The arc provyazyvaem 5 columns without sc, and in the end of the series make the connecting bar, introducing the hook in the great circle loop. 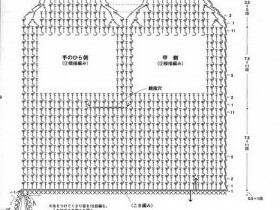 Then knitting turns and along an arc in the same manner with the fixing circle of a large, is knitted more 6 rows of columns, without sc. Once the head is finished, We start doing legs. For this dovyazyvaem large circle to the place, where the first leg will be located and is knitted from this point 10 stitches, that binds columns without sc. Likewise vyvyazyvayut five feet. For points of white circles vyvyazyvayut, tieing one row of columns without nakida ring 4 stitches. Number of points create at their discretion. Having done all circles, sew them to the red circle, then sew a circle and a lower and an upper part, leaving the bottom ladybird not stitched. The hole must be of such a width, to hand could pass freely into it. After which the product can be considered ready. How you managed to make learning to knit washcloths on their own quickly and easily, and the process itself is very entertaining and takes very little time.